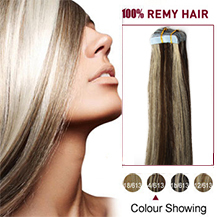 100% remy human hair extensions and very competitive price! 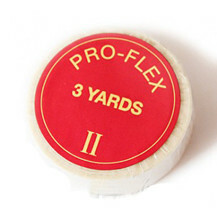 Tape on extensions, good flexibility and very strong. Very easy to attach.Can be washed,heat styled. 40-60 pieces are recommended for whole head. Hair Length Available:10~26 Inches(It charges extra cost for longer lengths, please see drop down box below for detailed price. I was hesitant to purchase these extensions but so glad I did! Beautiful quality and there is a lot of hair per set. Hair curls and straightens beautifully. Highly recommended and that’s coming from a picky lady. Quality of the hair is Very good! Delivery was a lot faster then expected, the colour was the same as shown in the picture.. excited to put them in. Love these extensions. They apply so easily and matched my hair color perfecly. I would reccomend these to anyone looking for new ways to style their hair! when i recieved them they match my hair PERFECTLY! I didn't have to die them or anything! i was very happy on the quality of the hair would recommend this seller to others and they have great prices. of the head. Adhering them will not cause any damage to your hair, and they are easily applied without the use of tools, beads, clips, or chemicals. The extensions are gently removed using a bond remover. With the proper care, tape-in extensions can last as long as other types of extensions, about 6-12 months. Very competitive price, Can be washed, heat styled. High quality, tangle free, silky soft. your own hair and can be styled, curled or straightened as desired. 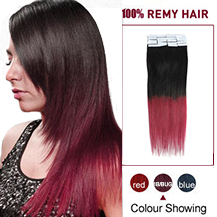 This hair extension is easy to apply & quick to learn - very competitive price. Very Comfortable to wear and safe - won't damage your own hair. this extension can be used at least for 6 To 12 Months. The Hair Material is Remy Human Hair,can be washed. The color is Medium Brown(#4),the total weight is 30g. 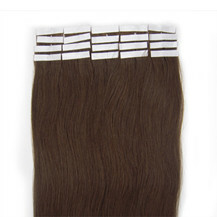 This product's length size is 16 Inches,High quality,tangle free, silky soft. There are two methods used in the application of tape hair extensions one is the sandwich method and the other is the single method. Re-apply with super tape after 8 weeks. 1. Hair must be applied to wash unconditioned hair. Part your hair in desired area where extension needs to be applied. 2. Remove the white cover on the tape extension to expose the sticky tape. (For longer hold, the super tape can be applied) Warm the tape with hair dryer or flat iron before applying to hair. 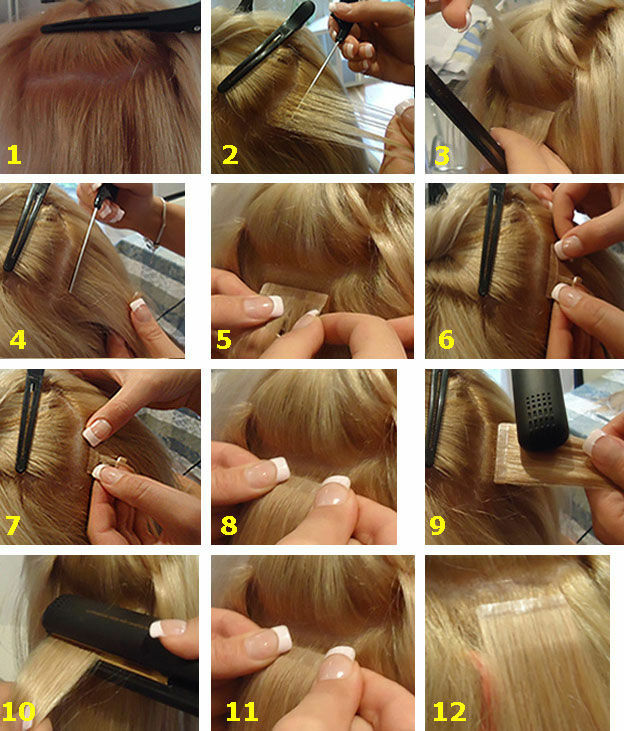 Line up the extension directly even with the scalp and attach by pressing to piece of desired hair. 3. You then double the thickness by adding another layer to the underneath of the piece. 4. The two sticky sides will be facing each other and your section of hair will be in the middle. 5. Again, Apply heat by blow dryer or flat iron to seal. 6. You are finished! Your hair is now thick and seamless! Do not wash hair for three days after application. 3. The sticky side will be facing your scalp. 4. Again, Apply heat by blow dryer or flat iron to seal. 5. You are finished! Your hair is now thick and seamless! Do not wash hair for three days after application. You will be redirected to PayPal website and pay directly with your paypal account if you have one. it is very fastest way to completle the payment. You will be redirected to PayPal website when you place an order. If you have a paypal account, you can log in your account and pay with it. If you don't have paypal account, it doesn't matter. You can also pay via paypal with you credit card or bank debit card. Payment can be submitted in any currency. 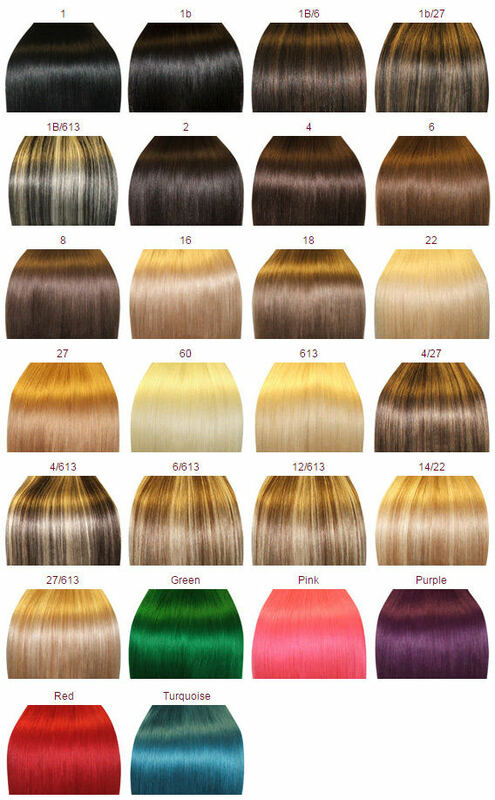 What type of Hair is used in Extensions? We used 100% Human Hair in our Extensions. Nothing beats the versatility of human hair extensions. Human hair, unlike synthetic hair can be straightened with a flat iron, curled with heat, or chemically treated to perm or dye the hair. Thin and fine hair becomes full and thicker. Short hair transforms to long, luxurious hair. We guarantee that the hair we sell is 100% Natural Human hair. Is your hair Remi, and what is the difference from other hair? Yes, we use Remi Hair in our extensions. The term 'Remi' or 'Remy' means 'Cuticle correct'. 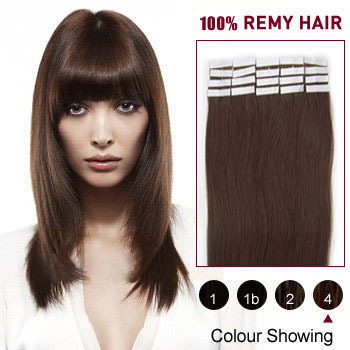 This means that only the finest virgin (Untreated & not previously coloured) hair is used. The hair differs from normal 'Silky' hair that’s available on sale, because it is hand picked & aligned so that every single strand runs in the same direction that it grows from the scalp. This ensures that the cuticle on each hair is running the same way (downwards), in order to keep the hair shiny, soft & truly tangle free. After picking & aligning, the hair goes through a gentle but very complicated treatment process, to colour, straighten or wave the hair in the best way. ‘Silky' hair has the cuticle removed; whereas 'Remi' hair has the cuticle still intact. So although 'silky' hair is still fabulous for extensions, 'Remi' has a shine like no other & will not matt or tangle when worn for long periods. Can they be straightened, curled or tongued? Yes, simply because it’s real human hair you can straighten and curl the hair. This actually is a test in itself to know if you are not being sold a synthetic product. Can I shampoo them and how often should I do that? Wash them as you would your own. Shampoo and conditioner. Nothing fancy. Please see our Clipin Guide for detailed instructions. Can I dry the hair with a hair dryer or use tongs? Treat the hair as if it is your own. Use a hair dryer or tongs, even when fitted. But as with your own hair, never use a hairdryer or tongs too hot. You will dry the hair and it will not last as long. Can I colour the hair? Yes. The hair can be coloured. As a general rule it is easier to darken the hair than to lighten the hair. But blonde hair has been bleached more so more caution must be taken. Always use a good quality hair dye and test a small sample first. Order with confirmed payment will be shipped out in 24 hours and 1-2 days for order placed on weekends.